The moon on the 19th October is new and ushers in the Hindu New Year as millions in India around the world celebrate Diwali, the joyful festival of lights. Diwali is the biggest event in the Indian calendar (which goes on for 5 days) is often called the festival of lights, the most significant spiritual meaning behind it is “the awareness of the inner light”. It represents the victory of good over evil and is marked with a deep spirit of joy. Diwali symbolises the victory of good over evil, the triumph of light over darkness, and hope over despair. Families and friends gather in homes brightly lit with oil lamps and candles. Women dress in their finest, most colourful saris and decorate their doorway floors with bright powders in intricate Rangoli designs. Sweets and cakes are freely offered and gifts are exchanged amid joyous family reunions that culminate in firework displays. 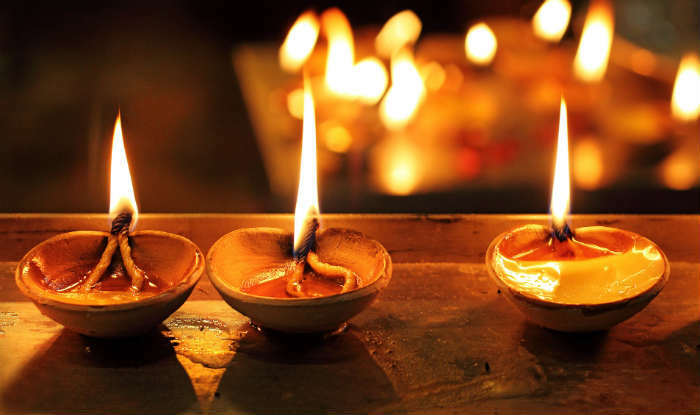 The word Diwali comes from the word Deepa (lamp) and Avali (a row) and signifies a row of lights. Diwali has rich spiritual meaning – the rows of lights represent not just the essence of light in our lives but also gives us time to reflect on all that is good in life. The mythical stories told all point to the importance of knowledge, self-inquiry and seeking the right path in life. In spiritual traditions its is a time to illuminate ones inner light - the light of knowledge , compassion and joy. A time to illuminate a row of lights in our lives. In the context of yoga, a light (or flame) is used to describe our awareness. The more awake and elevated we are in awareness, the flame of awareness is shining bright. When we are lethargic, the flame of awareness is dull. When our mind is filled with too many turbulent thoughts, the flame of awareness is unsteady, it is flickering. One of the aims of yoga is to make the flame of awareness shine bright (elevate our awareness), and at the same time hold the flame steady (peaceful without agitation). Engaging the the practices of yoga brightens the light of our awareness, so we experience clarity and it allows our inner vision to have sufficient resolution to discriminate between that which serves our growth and that which does not. In Hindu mythology, Diwali marks the return of the virtuous Lord Rama (representing God) and his idealised wife Sita (symbolising the mind) to their kingdom Ayodhya after spending 14 years in exile. Their story is told in the ancient Indian saga, the Ramayana – traditionally attributed to the Hindu sage Valmiki and one of world literature’s biggest epics consisting of some 24,000 verses. The story narrates the life of Rama and his struggle to rescue his wife from the 10-headed demon king Ravana (representing the ego) who had kidnapped and absconded Sita to Lanka. With the help of his faithful friend, the monkey god Hanuman who symbolises prana, Rama rescues Sita after a terrible battle in which he shoots an arrow into Ravana’s one week spot, killing him. To celebrate the return of their king and queen, the residents of Ayodhya lit rows of clay lamps – to light the path on a dark, new moon night – as flowers and garlands rained from the heavens above. Each day of the five-day festival has a special thought or ideal attached to it. The first day is known as Dhanteras, the Dhan meaning “wealth”; on this day prosperity is celebrated. The second day is known as Narak Chaturdasi – on this day it is said the goddess Kali and Lord Krishna destroyed the demon Narakasaru and freed the world from evil power. The third day – this year on 19th October – is Amavasya, the new moon day and most important day of Diwali where the goddess Lakshmi is celebrated. The fourth day marks Lord Krishna’s defeat of Indra, the god of thunder and rain. And the final day of Diwali celebrations is known as Bhai Duj; it celebrates the love between sisters and brothers.